I'm not what you call a "canner." I've never canned or preserved fruits for fear of catching botulism from improper sterilization. It just always seemed much too complicated. 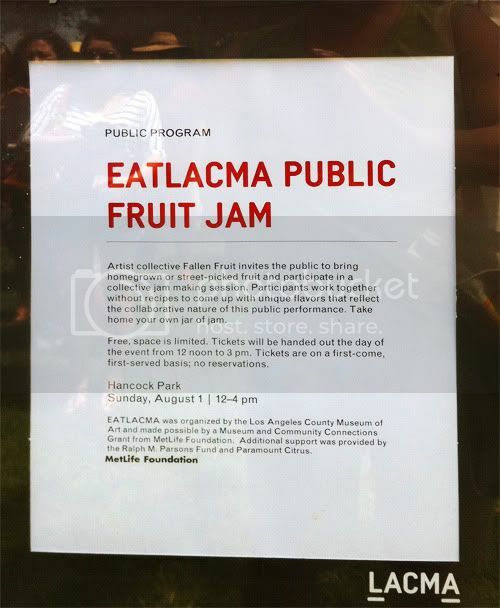 But when the dudes behind Fallen Fruit and Eat LACMA made it sound so easy, my mom and I decided to join in on the fun. I had determined early on that I would make fig jam. My dad created the most delicious rack of lamb with fig sauce last week, and I'd been craving it ever since, so figs were high on my list. 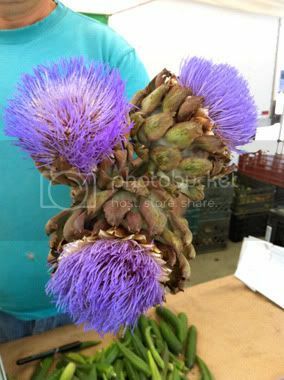 We headed out to the Eagle Rock & Roll Farmers Market (simply because we had never been to it) and found doughnut peaches, dinosaur egg pluots, blueberries (and even these very interesting artichoke flowers), but no figs. Nor were they at Henry's or Trader Joe's. I heaved a sigh of relief and decided to carry on. Arriving at the museum, we made friends with strangers in line, and ended up sharing our offerings. There was also a communal table where, lo and behold, someone had donated figs! And poblano peppers! And herbs aplenty! All of these went into the chopped yummy goodness. After we filled a bowl, it was time to cook up some magic. The Public Fruit Jam was a family-friendly affair, so I as I stood in line for a pot, I watched a little boy create his magical jam while standing on two huge sacks of sugar. I even videotaped him and his father spooning it into jars, which was super cute because the little boy was awestruck by what he had created (8 1/2 jars worth!). The whole afternoon had a super-friendly community-coming-together vibe, which I'm pretty sure is what the event designers had in mind. Finally it was my turn. 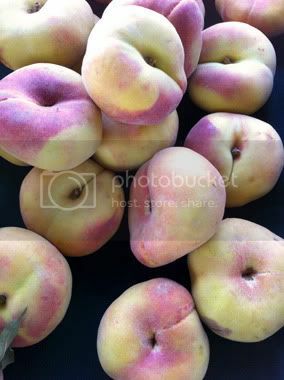 We threw my chopped concoction in with some pectin and water, brought it to a boil, tossed in LOTS of sugar, tried to mash up the peaches (they were a bit hard and didn't break down very easily), added some basil, and voila! Jam! We were encouraged to take up to 3 jars home. My jam recipe yielded 6 1/2 jars, and there were plenty others to choose from on the community table, but I opted for 3 of my own jam. I hope the other 3 1/2 jars were enjoyed by others. 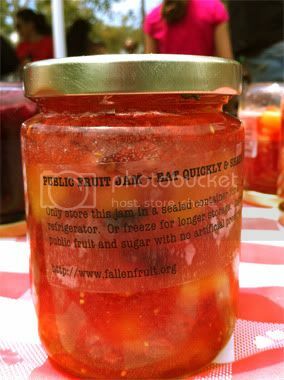 The jars were provided by Fallen Fruit. Home cooks who choose to can at home should follow good sterilization techniques! The recipe that follows is exactly how we made the jam in the park, over hot plates and in communal pots. Your mileage may vary. 1. Chop all the fruits and vegetables into small pieces, approximately the same size. Note that the citrus peels should be chopped as finely as possible, as they don't break down very well when boiled. 2. Put all ingredients, except sugar and basil, in a large pot over high heat and bring to boil. Stir to incorporate all the pectin. Cook until fruits are desired softness. 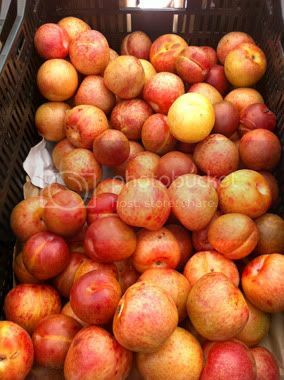 Harder fruits, like my peaches, may take a little longer to soften. Use a masher if necessary. 3. Add sugar and bring to boil for approximately another minute. Liquid should have a thickened considerably. 4. Turn off heat and add basil. Stir to distribute throughout. 5. Ladle jam into jars. The very patient and cheery volunteer cooks told us that holding the jars at an angle allows the air to escape as the food goes in, and also facilitates easier filling. Leave about 1/4 inch of head space, cap and immediately invert the jar. This allows for vacuum sealing without pressure cooking. 6. Allow jars to sit upside down for at least 5 minutes, though you're best off not touching them at all for at least an hour. 7. Refrigerate after opening. They should last about a week once opened, if they don't make it into your tummy before then. 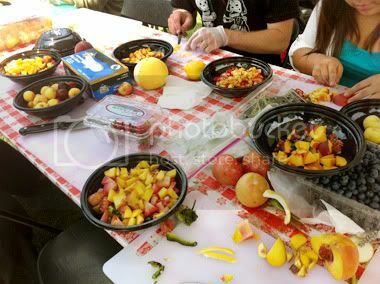 The Public Fruit Jam was amazing. We spent a beautiful afternoon outside enjoying the sun and fresh air, learned a new skill, and met some very nice people. Thanks to the guys at Fallen Fruit for creating such a great event. We're looking forward to the finale Let them Eat LACMA in November!